Last year's HappyBerry hampers were so much fun to design and put together with all my crochet patterns, videos tutorials and yarn goodies! They were a real hit! I was blown away with how much you loved receiving them and crocheting the exclusive projects. This year we have said goodbye to the hampers, but fear not, it was only so I could launch an even better crochet kit. A lot of you didn't like the subscription based model, mainly because so many people had the subscriptions for the whole year it meant many of you missed out getting a spot! So this year I launched a pre-order system instead where you can buy one off kits as and when you feel like one. This also works well if you would like to send one as a gift to someone special. (I even pop in a gift card at no extra charge if you type in a gift message). So there are no more scary and confusing tie-you-in contracts. It is first-come, first-served now though so if you have any concerns about missing out on a kit, you can simply join my dedicated mailing list where you will be the first to hear about when they go live before I advertise them on social media. My crochet kits are also smaller so that I can design and produce more, so more of you have a chance to receive these already limited crochet kits, and if you miss out, about a month after the mystery kit has been dispatched many of them do become available in the marketplace as previous kits, but this is not guaranteed and you will lose out on the FREE UK postage (and of course the fun surprise!) so do bare this in mind. So what's in my new crochet kits! Each kit has a theme and comes with an exclusive HappyBerry crochet pattern in US and UK terminology, both as a written printed pattern in the kit, an online downloadable PDF as well as any accompanying video tutorials in case you get stuck. You will have access to these digital versions in the HappyBerry online club, where you also have the option to pop me a direct message for support if you need to. All of my crochet kits are designed by me, Laura Eccleston, so you can be assured of 100% HappyBerry goodness. You will also receive lots of yummy scrummy squishy yarn to enjoy! Plenty to complete your project and have lots left over. This will usually be 2 to 3 balls of yarn, or a single yarn cake. You will also receive a hand-picked crochet hook that compliments your project as well as an extra themed treat! All this crochet goodness is then wrapped up in a silky organza bag so you can keep your project all together in one safe place. All of my crochet kits are available internationally too! You can check the cost in your local currency on the mystery kit crochet page and I offer FREE UK delivery for all pre-orders and reduced tracked international shipping as standard. I also realise that fibre content is important to some of you, especially if you are allergic to wool or are vegan conscious so all of my mystery crochet kits, although a mystery, now display the fibre content on the listing so you can be rest assured in knowing what fibre content you are receiving in your kit. Also my crochet kits are never sent wrapped in horrible plastic wrap. Instead they are delivered in my HappyBerry fully recyclable boxes, with a fun stitch pattern on the side that you can even crochet! If this all sounds super exciting then you can find out more today at www.happyberry.co.uk/kits and I look forward to welcoming you into the exclusive HappyBerry crochet club! This is essentially an advert for the companies mentioned, but I have not been paid to promote them. All reviews and opinions are my own. Links may link to affiliate pages, where I may receive a commission for orders. 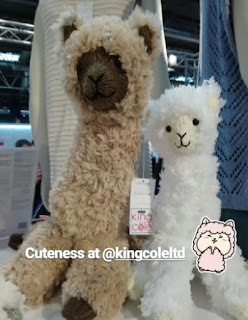 I thought it about time I wrote a blog post, and what better than having a re-cap of my experiences from the Stitches Creative Craft Trade show at the NEC in Birmingham this week. This craft show is a little different from the consumer craft shows as it's for businesses and companies of all sizes to come together to network and do business with each other. It is a fantastic opportunity for crafty entrepreneurs as well as established businesses to discover new companies and products all in one place. So I decided to pop along to check out some yarn companies and wholesalers who I can work with and collaborate with on my new launch of crochet kits this year, with my crochet hampers being such a success last year. I wasn't sure what to expect. I knew what I wanted to achieve and that was to discover some amazing new yarny people I can work with and I certainly wasn't disappointed in that area. I was super excited to catch up with KingCole who have been absolutely amazing in helping me achieve my ambitions with my crochet hampers and kits, and so far we have enjoyed Opium Palette in our Summer 2018 hamper, ZigZag sock yarn in our Autumn 2018 hamper and the gorgeously sparkly Shine DK in our Winter hamper so I was excited to see what new yarn ranges they are bringing out this year! Stay tuned on that one. I was also super excited to meet the team at Rico as I am a big fan of their yarns, especially their cotton ranges. I was not disappointed. I was interested to see that they had a Vegan yarn on display as well. A great team of people and a gorgeous range of yarns. So much colour and softness! I was also delighted to see some foreign brands make an appearance such as Gründl from Germany, Lion Brand from the USA, Novita from Finland and the lovely Shannon from Cascade yarns in America. Novita especially, took part in the fashion show, showcasing some of their new knitwear designs coming out soon, which absolutely blew me away. I instantly fell in love with their Nordic imagery and natural yarns! I think I want to literally move there now and start raising sheep. I was also honoured to meet Mr Bonfanti himself, from the Italian button company Bonfanti’s buttons. These stunning buttons have earned well-deserved recognition from the best tailors and Italian fashion houses over the years and are certainly no plastic mass-market rubbish. Made from real mother of pearl, precious metals and resins, these buttons are truly exquisite to look at and touch. They will definitely be making an appearance in my crochet kits at some point! Last, but most definitely not least, I was so happy to come across and meet the lovely team at Baa Ram Ewe and discover their amazing yarns in person, which I will definitely be trying to incorporate into my crochet kits later in the year. A gorgeous range of British Yorkshire yarns encompassing everything wonderful about rural life here in England such as yarns from the Masham Yorkshire sheep breed, Wensleydale and Bluefaced Leicester wool and even UK Alpaca fibres. Yorkshire, as you may have guessed by now, is truly the home of wool here in the UK and I'm so happy to see companies like Baa Ram Ewe promoting it. They also have the cutest shop up in Chapel Allerton, which I have to visit one day! Of course there were also a fair few companies that didn't rise to the occasion, who shall remain nameless; overcrowded stands, inaccessible yarns and just plain rude sales reps, but the one thing that shocked me the most was the reaction I received a few times when I explained what HappyBerry did. The disparity between online and offline businesses still seems huge. As an online business that uses social media a lot, I was often met with confusion, judgement and just plain disregard when I talked about what HappyBerry was all about. I was really surprised that some quite fairly large companies weren't open to the idea of the massive online craft community. On one particular occasion a sales representative of a rather large yarn company here in the UK felt it necessary to continuously repeat their requirements of doing business with them. I left that stand feeling quite angry at how closed minded they were. I felt it appropriate on only two occasions to ask if the business would like to take a photo with me so I could share what they did with my followers and showcase their gorgeous products to a wider audience. It reminded me of the time I started in web design back in 1999 and how difficult it was to convince companies to have a website, even after explaining it was an online catalogue and the modern way to showcase their work. Although many companies have websites now I was shocked to discover they barely had a presence on social media. Yes, social media is horrible when used negatively, I think we can all agree on that, but the crafting community is wonderful and I love how we support and encourage each other. It's a shame to see these offline companies missing out on that. I have also only just discovered that there's a magazine dedicated to the craft business community, who share articles by experts and what's hot and new in the crafting world... yet, barely a presence online. Anyway, I hope you enjoyed reading my post. Do join me on Instagram for up-to-date information on what I am designing, sharing and posting, such as my journey to the Stitches show. I have extra exclusive video tutorials over there and I'm also sharing what's on my hook! I hope to see you over there.